For over 20 years, Tania has taught models how to pose in front of the camera & every photo shoot requires a little practice beforehand if you want to look & feel amazing. Here are some more tips on striking the perfect pose for the perfect wedding photos! Keep your shoulders relaxed, down and back. If you are self-conscious about your upper arms, keep them slightly away from your body and avoid ‘smooshing’ poses. Stand at a 45 degree angle, not straight on, to slim your figure. (A good photographer will be able to let you know what angle slims you the most.) Put each leg in a slightly different position and put all your weight on the back leg. If your dress is shorter and your legs are showing, point your toes, bend your knees and position each leg differently. Don’t forget to shift your weight on one leg more than the other. Interestingly enough, “awkward” leg positions photograph better than the more relaxed, comfortable. 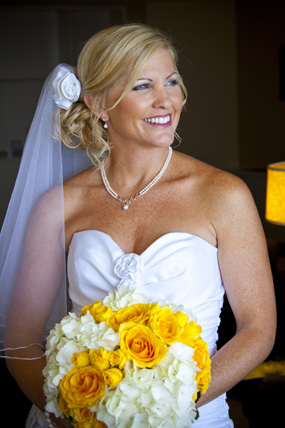 For a more natural look, hold your bouquet in one hand and allow the other arm to relax and your hand to be soft. If you feel your hands and arms tensing up, take a moment to shake them out and start again. A slight curve of the fingers always looks better than straight. Research. I know, that sounds like homework. But look through the bridal magazines and all the Internet photos of celebrities at award ceremonies & movie premiers. They are experts at posing so they look their absolute best – learn from them. Practice in front of a mirror! Gather your bridesmaids, some snacks, a bottle of champagne and practice till you feel you look your best. Then, it will be more natural on the big day.